What Does It Mean When Goldfish Turn Brown? If your goldfish has gone brown, you may be able to restore his former brilliance with some TLC. The goldfish you picked out at the pet store for his brilliant colors isn't always the goldfish you'll see zipping around your tank or pond a few months or years later. Sometimes goldfish's colors change, usually because of a change in exposure to light, his genetics or a health issue. Lack of exposure to light is a common reason why orange fish turn brown. Plenty of light means plenty of color for goldfish. Fish keepers recommend goldfish get 12 hours of light and 12 hours of darkness per day. If fish are kept in an outdoor pond, this will happen naturally. Color in a fish is a bit like getting a tan for a human -- exposure to sunlight causes the color pigments (melanin) in our skin to darken, and for goldfish, light causes the pigment in their scales to be more brilliant. If your goldfish has gone brown because of low light, giving him some sunshine or a stronger tank light very well may restore his former sunny glow. It's a perfectly natural process for fishies to change color throughout their lives. Only the most selectively bred fancy goldfish will not change color at some point. Color changes usually happen during the first year of a fish's life as it's maturing, but a color change can still happen several years into a goldfish's life for genetic reasons. From Mother Nature's perspective, it makes more sense for a goldfish to be dull in color rather than bright and flashy. In the wild a bright orange goldfish is an easy target, where a brown one blends in with its surroundings. What your goldfish eats can affect the brightness of his colors. Goldfish are omnivores, so experienced fish keepers recommend feeding your goldfish a varied diet that includes fresh and store-bought fish food. Many fish keepers feed their goldfish animal proteins like bloodworms or krill to enhance their orange color. Certain diseases can cause a goldfish to lose their bright color and appear dull. Nutrient deficiency is one of them. A varied, balanced diet is important. Fish may also dull in color if they have worms or other parasites. If you're concerned your fish has turned brown because of a health issue, check for other symptoms, like sluggishness, a slimy coat over the scales, puffed-out scales, or inability to control the swim bladder. Once you know what ails your fish you can treat him accordingly and bring him back to health. Has your fish turned uniformly brown, or is he only brown in spots? Brown or black spots may be caused by bruising or ammonia burns. Bruising is just what you'd think -- areas on a fish's body that have been injured and are healing. A fish may get bruised for many reasons, for instance getting thrown around by a strong filter flow, or if they're bullied by other fish. Bruises will heal on their own, but keep watch to see if what's causing the bruising will reoccur so you can remedy the situation. Ammonia burns can also cause brown or black spots. Goldfish thrive in a pH of 6.0 to 8.0. Red streaks on the fins usually accompany the dark spots. Ammonia accumulates in a fish tank when fish pass waste and the water isn't cleaned often enough. The filter does some of the work to remove water toxins, but regular water changes are also necessary to keep ammonia levels safe for your goldies. Goldfish Connection: What Are the Three Common Reasons Goldfish Change Colors? What Does Pink on a Goldfish Mean? Do Goldfish Need a Tank With Filtered Water? Do Parakeets Change Color out of Sickness or Is It Natural? How Do Goldfish React to Mirrors? What Happens when a Goldfish Starts to Get Black All Over? What Causes Goldfish to Lose Their Color? 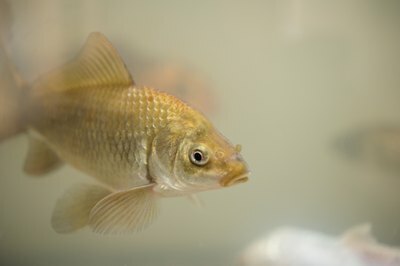 What Are the Causes of Goldfish Spitting Out Food?